When teeth become damaged or badly decayed, restorative care becomes essential. For a single tooth in need of help, dentists often turn to all-porcelain crowns. With an all-porcelain crown, it’s possible to provide patients with restored functionality, as well results that blend in with the rest of their smile and look natural. It has to do with the way all-porcelain crowns reflect light. Instead of looking unnatural, they reflect light the way natural tooth enamel does. Compare this with the more opaque look at a porcelain-covered metal crown. An all-porcelain crown can be placed in just a couple of visits. During the first, your dentist will prep the tooth by numbing area with a gel and a local anesthetic. Then, when the damaged portion of the tooth has been removed and an impression has been taken, a temporary crown will be put in place. Based on the impression and your doctor’s unique plan for you, a trained ceramist will carefully create a custom-made crown. When it’s finished the patient will return for a second appointment, during which the final crown will be put in place. 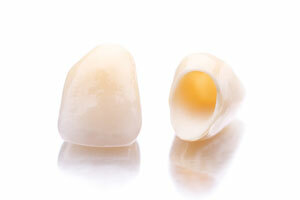 Do you need to repair a decayed or broken tooth with an all-porcelain crown? Call us today to learn more or to schedule a consultation.